I really don’t know what the allure of the laundry basket is for Liam. 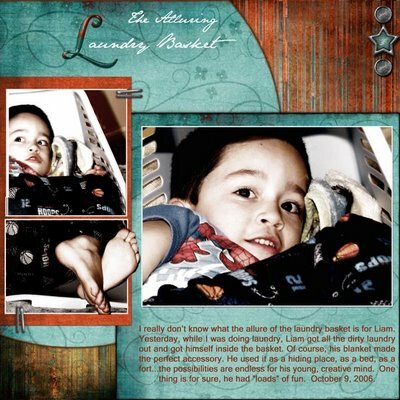 Yesterday, while I was doing laundry, Liam got all the dirty laundry out and got himself inside the basket. Of course, his blanket made the perfect accessory. He used it as a hiding place, as a bed, as a fort...the possibilities are endless for his young, creative mind. One thing is for sure, he had “loads” of fun. October 9, 2006. Layered sketch by designer Brenda Kempf. Thanks Brenda! Inked edge done with an action by Atomic Cupcake.